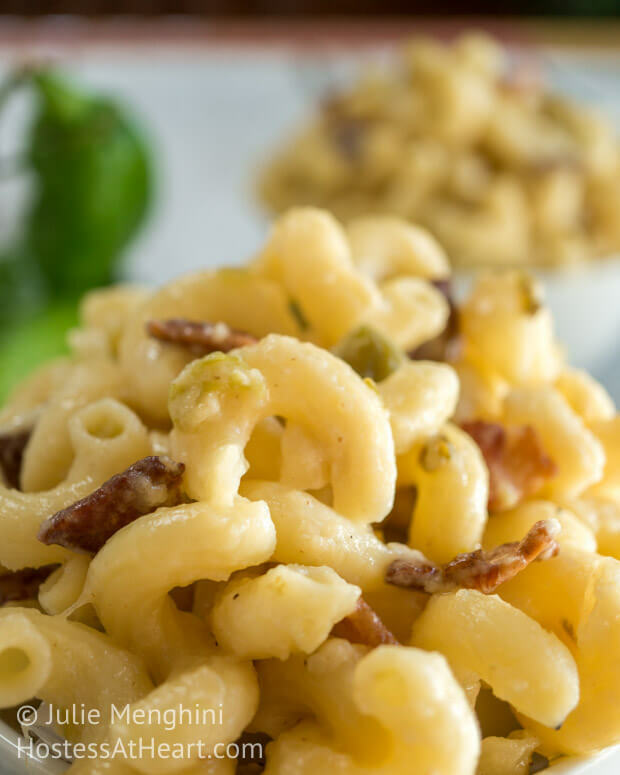 Hatch Chile & Bacon Mac and Cheese is an easy dish that combines smoky bacon, creamy Gruyere with a rich cream that finishes with a subtle heat. 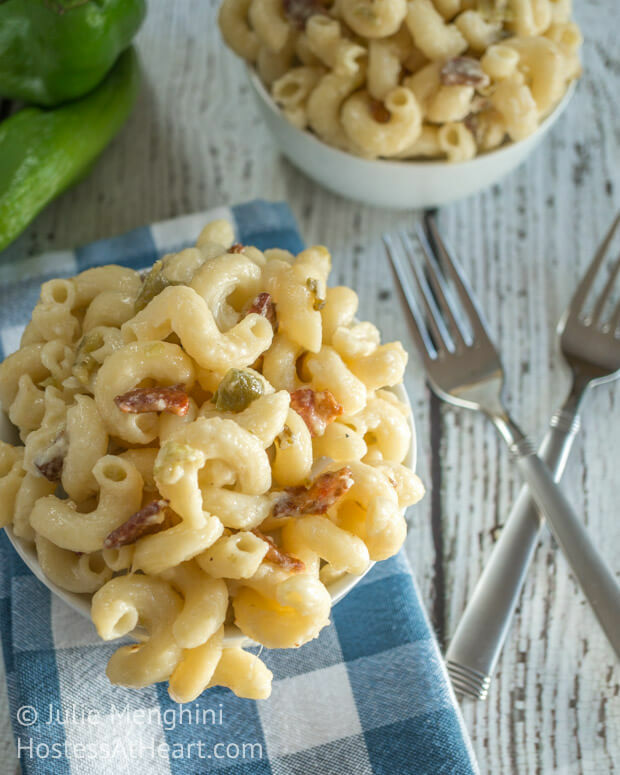 This Hatch Chile & Bacon Mac and Cheese is incredibly delicious! I recently served it to guests, and I have never had guests ask for take-out containers, until now. For the last few years, hatch chiles have really gotten popular. I hadn’t tried them, but last year I swore when they came out this year, I was going to. There is such a short window when these chiles are available, so I was pretty excited when I saw them in the grocery store. The employee in the produce section told me that there wasn’t much of a difference between the hot and regular hatch chiles. That was a big ole fat lie! I roasted up all of the hot hatch chiles, until blackened and blistered, on the grill, and then let them sit in a zip lock plastic bag to steam. When they had cooled enough to handle, approximately 15 minutes, I started removing the skins. The aroma from those babies sucked the breath straight from my lungs. I had a coughing fit that I wondered if I would ever recover from. Thank goodness, I bought some of the regular ones too, and back to roasting I went. This dish is creamy, smokey and delicious with a hint of subtle heat in the end. I served it as a side to steak, but I could have just eaten it straight from the pan! As you can see, the recipe explains how to toast the Panko bread crumbs that this dish is topped with. They didn’t make it into the picture, but I highly recommend that you don’t skip this step. They add just the right amount of crunch to an already perfect dish. In a large skillet, bring cream to a boil. Continue boiling until reduced in half. 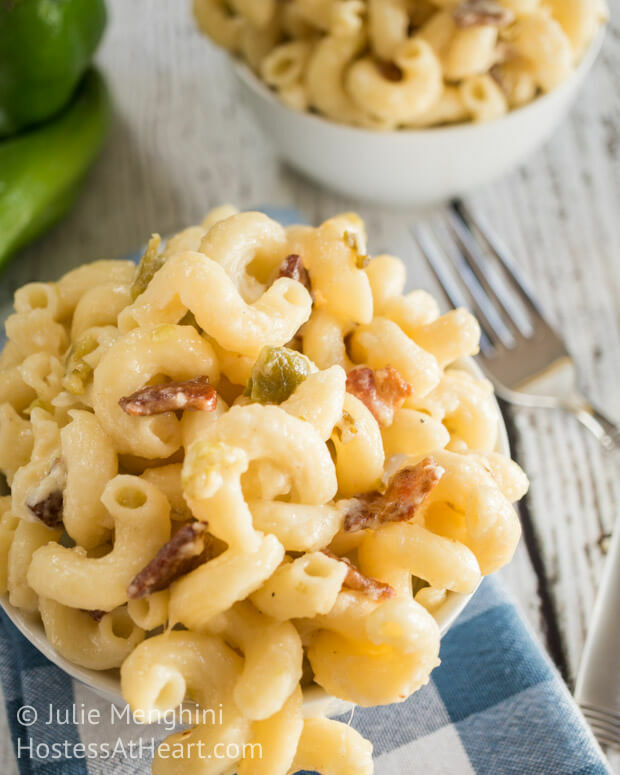 Stir in cheese, bacon, chiles and cooked pasta. Add 1/4 cup pasta water, and stir until cheese is melted and smooth. Add more pasta water if necessary. Cover and remove from heat. In another skillet, melt butter and stir in Panko bread crumbs. Stir continuously until browned. Garnish pasta with toasted Panko bread crumbs and serve immediately. I got 10 servings when I served this dish as a side. You can get 4 to 6 if serving as a main dish. 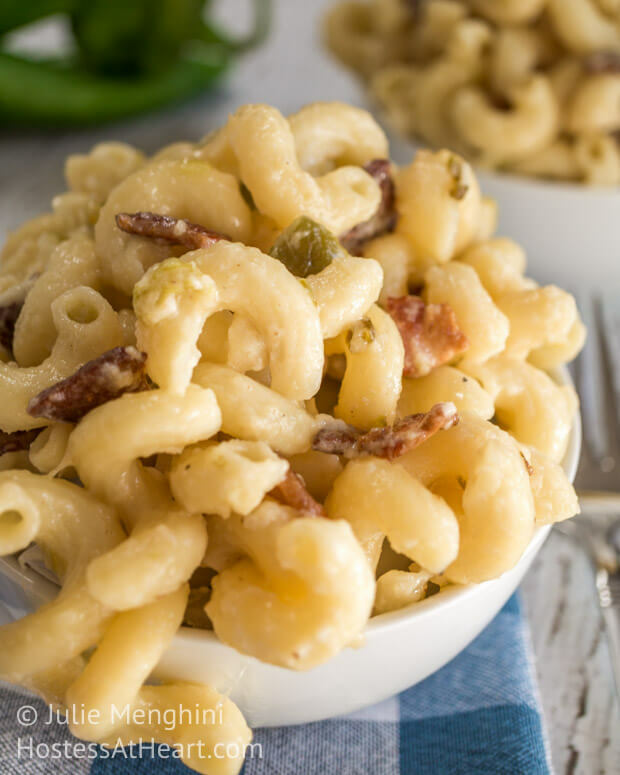 Also, you can use any pasta, but the Cavatappi has little ridges that hold onto the sauce. It also holds its shape as a firmer pasta. Lastly, do not add oil to your pasta water. That oil will fill those ridges and keep them from holding on to that amazing sauce. Thank you Michael! I never eat mac and cheese and up until now it wasn’t a big deal. I find myself craving this stuff! Thank you Cheryl! Happy Friday! Hi Julie have a great weekend. Are you and John doing any special? Thanks Cheryl! We are having 6 people over for grilling tomorrow night and have a charity action on Sunday night, so it’s a busy weekend but a good one. I hope you have a great weekend too! Thank you – and enjoy your activities Julie! #8! Heavens girl. You are definitely plugged in! I have been checking wegrazetogether, but haven’t had the chance to dig in yet. HA-true! In 14 days we graze together has had 279 views/every blog average 5 views thus far. Pretty cool considering its only 2 weeks so far. Thank you Petra! You can use any chile with as much heat as you enjoy. If you make this, the recipe needs twice as much breadcrumbs as you will need. I froze the extra, but you could just cut that ingredient in half. Curse that lying super market person! I know that cough. It’s no joke. I’ve been seeing hatch chiles in the blogosphere of late and my curiosity is definitely piqued. I am simultaneously in love with, intimidated by and mystified by peppers. There are so many different kinds! So much to learn. Thanks for linking up at #SaucySaturdays. Thank you! 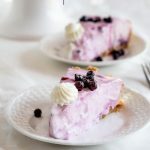 It is a delicious recipe! I made this yesterday Julie but with poblanos substituting for hatch chilies which I could not find. They only imparted a mild heat at best. I did love the simplicity of the recipe and using the corkscrew pasta shape. I found the recipe made twice as much crumb topping as what was needed so when I write it up, I will reduce those quantities in half. I also added garlic to the cream. It was delicious. 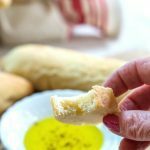 Johanne, I am very happy that you enjoyed this recipe. I should have mentioned that it made a lot more crumb topping than was needed. I put my extra topping in the freezer for a future use. Thanks for letting me know! That’s what I did also Julie. Thank you Kaila! It will be a returner to my table! Your Mac & Cheese looks delicious, love the idea of roasting the hatch chillies. I’ve got some similar chillies growing in my veg patch & I put them on a pizza thinking they were mild, talk about blow your socks off! Thanks for the tip on not putting oil in the pasta water Julie, really useful. Thank you Sarah! Any chile pepper will work. Those darned peppers look so innocent until they blow your socks off! Thank you! Hatch chiles are a New Mexico pepper so any pepper will work. It was so delicious. I hope you will let me know what you think if you give it a try. Enjoy your weekend! Sounds tasty & easy to make. 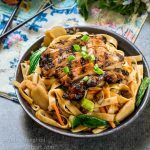 Pinning it to comfort food board! Thank you Joy! I appreciate that! Thank you Sarah! It is a keeper for sure! Thanks Judi. I believe that they are basically a New Mexico green chili and this recipe could definitely be made with other versions. I like the grill for roasting my veggies. I don’t have to stay hunched over looking through an oven door, and there isn’t a mess. I don’t own a dehydrator but what a genius idea to get more use from it! The most important thing of all you do not have that “hot” pepper smell floating through your kitchen! I agree with that. I always cook bacon on a burner on the grill if I don’t bake it too. Those aromas just linger. Thank you Amanda! Funny, I was following up on some links that weren’t working, and some were to earlier comments that I had made on your blog. Your photography has vastly improved very quickly my dear! I really have to redo some of my earlier posts. I enjoy the photography part of it but I have a long way to go. Guess that is part of the fun right? You solved a mystery for me, Julie. I’ve seen a few posts this past week dedicated to hatch chilis and was wondering why. I’ve never heard of them before, but now that I know they’re only available for a short time, I’ll have to see if I can get my hands on some. This mac n’ cheese looks delicious! I can see why your guests wanted to take some home, lol. Have a great weekend and happy FF! Thank you Natalie! We both had mac and cheese on the brain! I don’t eat it much, but boy was it a decadent treat! Wow this looks amazing, Julie! I could just dive right in! Very nice combination! Bacon and cheese, what’s not to like!!! Thank you! Who doesn’t like bacon? Well some people, but I feel sorry for them. Happy FF! This mac and cheese looks so tasty! I also have never used hatch chilis, but I can imagine just a touch of heat with the bacon would be a great addition to the cheesiness! 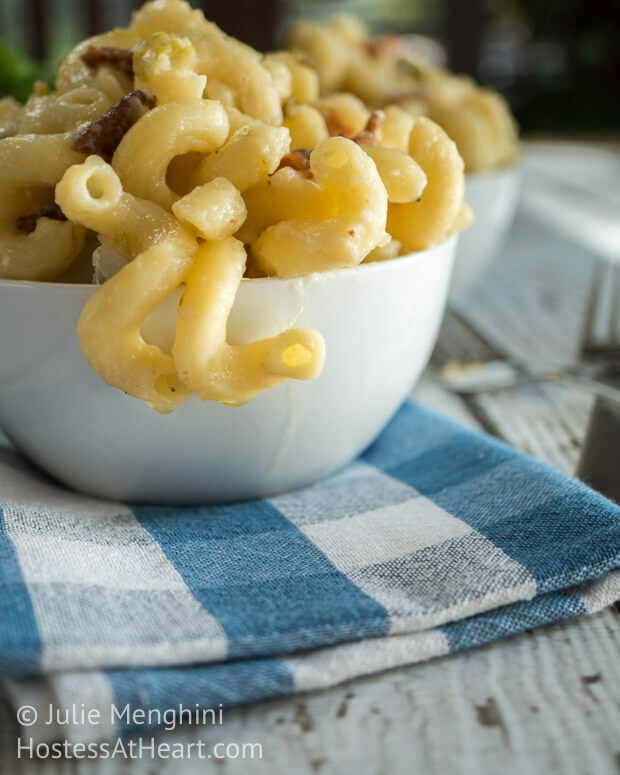 I absolutely love homemade mac and cheese, and your photos make my mouth water! Happy Fiesta Friday! Thank you so much Jenny! I really did love this recipe. It was rich and very non children’s mac and cheese! Yum! I love mac and cheese and this sounds so good! Thank you Nancy! You have a great weekend! Thank you! So happy that you stopped by! Thank you! It was a treat for sure! Something that starts with cream can’t be all that bad right? yes for sure!! yum! your blog is amazing! loved stopping by and looking around! You’ve made my day! I always try and drop a note when I like something but know a lot of folks don’t. It’s great to know that my posts are getting read! I know you have a lot of people stopping your by your great blog too! Thanks Julie!! so nice to finally meet your!! love your different flavors! Oh gosh, this looks heavenly, Julie! I love everything in this, especially the chilis. I can’t believe I haven’t tried any recipes with Hatch chilis before. I definitely want to try this one. Thanks for the heads up about the differences between the heat of the chilis. Thank you Freda! The Hatch chilis are already disappearing, but you could use any large chili with a bit of heat. I was blessed with sunshine on the day I took those pics. That sure makes the job easier! Julie, this looks so incredibly delicious!! I’ve had that happen with chile fumes — oh dear!! It’s an invisible force that can knock you right off of your feet! lol. Thank you Anna! I swear I thought I need mouth to mouth! Oh my I can’t even fathom eating habaneros let alone getting near my eye! I wouldn’t doubt that it could blind you! I like some heat but am kind of wimpy. We both have hot peppers on the rain and in the kitchen Julie! Wish I had used your line in my hot sauce pist because I was chocking on the fumes too! You had me roaring.! I will be making this. Not sure if I can find hatch chilies but will try. BTW, I made your meatballs(don’t ask!) again but with Italian seasonings. 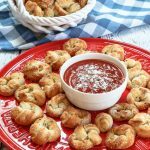 My son had one comment: they’re good but can you make the spicy ones instead??? guess who is off to buy hot canned peppers too? Thank you Johanne! Just pour a bit of your hot sauce into those meatballs, and those boys would be happy happy! Our hatch chilis are already disappearing, but you could use any of the larger peppers that have some heat such as Anaheim or New Mexico chilis? Those pepper fumes are killers aren’t they? I hate that part so will often use my mini chopper when making small batches. Let me know how your hot meatballs turn out. Welcome back, Julie! I haven’t had mac and cheese in ages. I will definitely try your recipe! Thank you! We had such a good time, but now it’s back to reality. I’ve been cleaning the house for two days because I haven’t hit it hard for a while. I had Mac & Cheese in ages either. It is one of those foods that is a rare treat. This version would be great with any meat, fish or by itself. Enjoy your day! I’m not much of a mac n cheese gal, but this does look good! love the bacon and chiles! Thank you Mimi! I can usually take it or leave it. It’s a rich food and I’d rather save the calories. This dish was a deal breaker though. I could have overdosed on the stuff! Oh, Julie! I’ve been craving Mac & Cheese. This looks to die for! Thank you Debbie! I know you and your Mountain man would love it! It’s a great comfort food for these cooler days. Sorry, we had 90’s last week so I think we sent that heat your way. Nice this week though! Thank you Loretta! There is a town in New Mexico called “Hatch”. They have a big festival each year. I have friends that attended this festival and loved the dishes that they had using them, so I just had to try and get some this year. I think any nice pepper would work. Next year I’m looking for the “Pueblo Pepper”. I would have asked for a take out container at your dinner last night too! I hope you caught a couple pictures of that tart! I totally get that Loretta! I hated to see the mac and cheese disappear out the door but knew that was best for my lack of willpower! I hardly ever allow myself to east something this high in fat and calories and knew it would lead to other bad choices! Yum, love adding chili to mac and cheese, and your recipe sounds lovely! Thank you so much! It is a keeper in this household. I appreciate your stopping by!